Fresno State in California offered some boxing from the 115 pound realm on Saturday. The 29-1-1 Jerwin Ancajas battled the 14-3 Jonas Sultan for the IBF word super flyweight title. On the undercard, the 23-0 Khalid Yafai faced off against the 21-5-5 David Carmona for Yafai’s WBA super flyweight title. 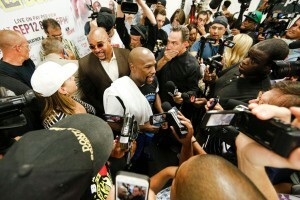 The fights were aired live on ESPN+, ESPNs new streaming platform from which the network hopes will spawn big things. The night opened with Yafai and Carmona. Before the bout, Carmona had expressed his waning interest in the sport of boxing to the ESPN team. Still, the man fought his heart out in what proved to be an exciting affair. Yafai dropped his man in the first, but Carmona got off the mat and actually seemed to hurt the champion himself before the bell rang to end the round. Yafai resumed control, but Carmona simply was not going to allow the Englishman to have an easy night’s work. After being dropped again in the fourth and once more in the fifth, it was obvious that Yafai was the dominant fighter. Carmona kept things exciting, though, and at no point in the bout did it seem like Yafai was blithely walking away with things. Ultimately, Carmona’s corner stopped the bout in between the seventh and eight rounds, apparently convinced that their man had simply had enough. There was no mistaking, though, that Carmona had made a good showing of himself throughout the fight. It was time for the main event. This match, for the IBF strap, was between two Filipinos who entered the ring looking and acting more like gentlemen than they did contemporary showboating athletes. Ancajas, the champion, was entering the fight with the reputation of being the more polished fighter of the two, while the challenger Sultan was known to be aggressive and entertaining. Both men lived up to their reputations. 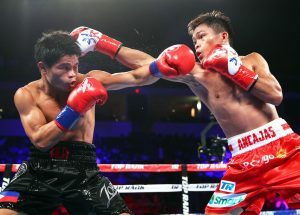 The crowd may have booed at times for the match not being a slugfest, but discerning fans saw a lot to appreciate in the skill set of Ancajas, who worked an effective jab and kept his distance throughout the fight. Sultan had certainly come to win and he did, in fact, have his moments. Those moments were too few and far between, however, and Ancajas walked away with a one sided decision victory. The fact that Ancajas was able to dominate as he did was a credit to the man’s craftsmanship. The defending champion simply never allowed Sultan to get into the match with any kind of regularity. 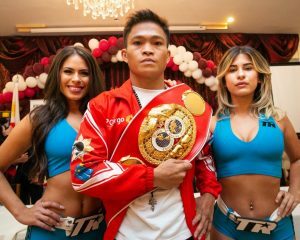 On Saturday night the first All Filipino World Title Fight in nearly one hundred years will take place as Jerwin Ancajas battles Jonas Sultan for the IBF Junior Bantamweight Title. The last all Filipino title fight was in 1925 when Pancho Villa defended his title against Clever Sencio. The WBA Junior bantamweight Title will also be on the line as Khalid Yafai defends his title against David Carmona. This fight card will be part of Top Rank’s deal with ESPN to broadcast fights on ESPN’s new ESPN+ streaming service. The Save Mart Center in Fresno, California will be the host site for Saturday’s fights. Khalid Yafai is a British Champion that is starting to make a name for himself. He won the WBA title in 2016 against Luis Concepcion and has held it ever since. He has never tasted defeat and has fourteen knockouts on his resume. He’s the same size as Carmona, but is considerably more experienced and successful both as a professional and as an amateur. Yafai had a very successful amateur career and represented the United Kingdom in the 2008 Summer Olympics. Carmona has no such successful amateur background. Carmona fought once in 2018, twice in 2017, and once in 2016. Yafai has fought twice in 2017 and four times in 2016. Carmona’s biggest win of his career was against Antonio Garcia. He has lost almost every time he has stepped up to face good competition. He has losses to Daniel Lozano, Carlos Cuadras, Naoya Inoue, Omar Narvaez, and Fernado Curiel. Yafai has defeated the likes of Sho Ishida, Suguru Muranaka, and Jason Cunningham. On paper this fight looks like a mismatch, and in the ring it will probably look like one. The winner of this bout may face the winner of the main event. Jerwin Ancajas is a twenty six year old southpaw Filipino Champion. He’ll be facing a Filipino contender in Jonas Sultan, who is also twenty six years old but fights out of an orthodox stance. Ancajas will have about a two inch height advantage. Ancajas has fought once in 2018, three times in 2017, and once in 2016. Three of his past four fights were KO/TKO wins and he has twenty stoppages during his career. Sultan is currently riding a five fight win streak with four of those five fights coming by KO/TKO. He fought twice in 2017 and three times in 2016 with nine stoppages during his career. Ancajas lone loss was to Mark Anthony Gerlado early on in his career in 2012. He has won every fight since then and has defeated the likes of Israel Gonzalez, Jamie Conaln, Teiru Kinoshita, Jose Rodriguez, and McJoe Arroyo. Sultan does not have the professional resume of Ancajas. He has losses to Go Onaga, Jonathan Francisco, and Rolando Servania. He has had some recent success including victories over John Riel Casimero, Sonny Boy Jaro, Mazakole Tete, and Tatsuya Ikemizu. Ancajas also has the edge in amateur experience. He allegedly has an amateur record of 90-5 while Sultan has an amateur record of 8-4. Ancajas has traveled all over the world to fight. He has fought in the United States, Northern Ireland, Australia, Macao, the Philippines and China. Sultan has fought in nations such as South Africa, the Philippines, and Japan. This will be Sultan’s first fight in the United States. Ancajas has the apparent edge in all the tangible comparisons with Sultan. He’ll likely shine on Saturday night with a bigger name opponent in the near future. 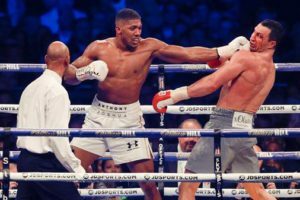 The following is the Boxing Insider notebook for the week of May 9th to May 16th, covering the comings and goings in the sport of boxing that you might have missed. Lorenza Fertitta, former co-owner of the UFC, recently told TMZ that he supports Dana White’s plan to pay Floyd Mayweather $100 million and Conor McGregor $75 million if they fight and believes they deserve it. Lorenza Fertitta, along with his brother Frank, invested $2 million into the UFC in 2001 and sold it for $4 billion in 2016. Sugar Ray Leonard and celebrity guests including Bill Bellamy (Event Host & Actor/Comedian), Bo Jackson (Former NFL/MLB Athlete), Chris Spencer (Actor, Black-ish), Cindy Crawford, Craig Robinson (Actor/Comedian), David James Elliott (Actor, Secrets and Lies), En Vogue (R&B/Pop Vocal Group), Holly Robinson Peete (Actress, Chicago Fire), Johnny Gill (Recording Artist), Judge Greg Mathis (TV Personality), Laila Ali Conway (Former Professional Boxer), Magic Johnson, Matthew Rutler, Mia St. John (Professional Boxer), Oscar De La Hoya (Golden Boy Promotions Chairman and CEO), Rande Gerber, Rodney Peete (Former NFL Athlete), Sergio Mora (Professional Boxer), Terry Norris (Former Professional Boxer), Tina Knowles Lawson, Tommy Davidson (Actor/Comedian), and Usher (Actor/Recording Artist). *All attendees subject to change. On Wednesday, May 24, B. Riley & Co. will present the 8th Annual “Big Fighters, Big Cause” Charity Boxing Night benefiting the Sugar Ray Leonard Foundation at The Loews Santa Monica Beach Hotel. Hosted by actor and comedian Bill Bellamy, the evening will feature live professional boxing presented by Golden Boy Promotions. The live fights will begin at 6:30 PM through 9:00 PM and the main event of the evening features Kevin Rivers, Jr. vs. Mario Macias in a featherweight bout scheduled for six rounds. The evening will feature a National Anthem performance by En Vogue, as well as a live & silent auction display, which will include iconic memorabilia and other one-of-a-kind items and experiences to benefit this important cause. Additionally, the event will honor nine-year-old Jackson Blair with the 2017 Golden Glove Award for his extraordinary dedication and hard work to raise money and awareness for type 1 (T1D) diabetes. The 8th Annual “Big Fighters, Big Cause” Charity Boxing Night is presented by B. Riley & Co., a leading investment bank which provides corporate finance, research, and sales and trading to corporate, institutional and high net worth individual clients. Rances Barthelemy is set to face Kiryl Relikh in a WBA 140 pound title eliminator on Saturday May 20th on Showtime from the MGM National Harbor in Maryland. Below are a few select quotes from a recent press conference. 1) How is training camp going? How have you benefitted from sparring and training alongside of your brother Leduan and Yordenis Ugas and have their recent performances been an indication of how you expect to perform? 2) What would it mean to you to become the first three-division world champion from Cuba? 3) What did you take away from Relikh’s loss to Ricky Burns? 4) How would you characterize Relikh’s style and how do you see this fight playing out? 5) Can you address your 11-month layoff and how your training has been geared towards shaking off any ring rust you may have? 6) How did you trip back to Cuba come about and what was it like to be back in your home country? 7) How do you rate your skills and progression as a fighter considering your last three dominant wins over top quality opposition? Do you feel that you are at the peak of your career? 8) Why did you feel it was time to rise in weight, especially considering the wealth of talent at 135 right now? Who do you consider to be the top 135 fighter now that you are gone? 9) Why did you make the decision to move from Miami to Las Vegas and how do you think it has benefited you? 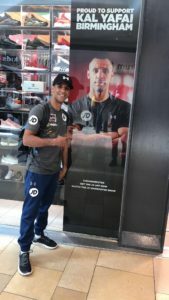 Top 126-pound challenger Oscar Escandon shares his thoughts on training camp and more ahead of his first world title opportunity against WBC Featherweight Champion Gary Russell Jr. Saturday, May 20 on SHOWTIME from MGM National Harbor in Maryland. Coverage on SHOWTIME begins at 6 p.m. ET/3 p.m. PT and features super middleweight contenders Andre Dirrell and Jose Uzcategui battling for the IBF Super Middleweight World Championship plus two-division world champion Rances Barthelemy taking on Kiryl Relikh in a 140-pound world title eliminator. In the telecast opener, from Copper Box Arena in London, Gervonta Davis puts his IBF Jr. Lightweight Title on the line against Liam Walsh. On Saturday, Kal Yafai thrilled his hometown fans in Birmingham, England, and made the first the defense of the WBA Super Flyweight title with a 12-round unanimous decision over Suguru Muranaka. The bout headlined another tremendous day of action AWE-A Wealth of Entertainment. “I am thrilled to be able to bring this action-packed cards to the American fight fans,” said Charles Herring, President of AWE-A Wealth of Entertainment. Yafai looked like he was going to have an early day as he sent his Japanese challenger down to the canvas in round two. Muranka proved sturdy and even had a few moments in the fight. Yafai was deducted a point in round eight for low blows, but he was comfortably ahead, and won by scores of 119-107 twice and 118-108. Yafai is 22-0. Muranaka is 25-3.